Long before microwave ovens became available, there was always a way to cook a wide variety of meals quickly and simply. I dare say, using a pressure cooker is a much better way to speed up your cooking time, as everyone is familiar with the gray food colors and rubbery tough textures that are experienced when nuking your food in one of those new fangled contraptions. Braising is one of my favorite methods of cooking. It’s the process of placing browned meat at least partially submerged in a generous quantity of liquid, such as crushed tomatoes. Or, you might just place some broth in the bottom of a pan to create a good base for a tasty gravy that will accompany your main course. With the oven set at a modest temperature, and allowing some additional cooking time, the end result will be tender meat falling off the bone, requiring nothing more than your fork. Ah, now that’s the basis for a great tasting meal, if you ask me. Even when I roast a turkey, an inch of water in the bottom of the pan will ensure that the bird doesn’t dry out. Plus, there will be plenty of gravy for the mashed potatoes! This same super tender, falling from the bone meat can also be accomplished in a much shorter timeframe using a pressure cooker. With just a stove top for a heat source and an old-fashioned cooking device known as the pressure cooker, tender juicy meats and vegetables can be on your dinner plate with very little fuss. Pressure cookers maintain a pre-set amount of pressure and steam within the cooking pot itself — by way of a sealed lid and a pressure-relief valve. As the heat boils, the liquid pressure rises in the pot forcing heat, moisture, and flavor into the meat. 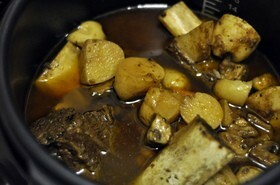 The result is a very tender, moist meal that was cooked in a fraction of the time required to braise the same meal. The best part: everything from meats and vegetables to desserts can be made in a pressure cooker. In the end, your food is cooked in one-third the time, and it’s much fresher tasting than microwaved food. This 8-minute video illustrates the versatility of cooking with a pressure cooker. They prepare an entire 6-course meal using a pressure cooker! Check out Alton Brown’s video illustrating how to use a pressure cooker. He discusses the scientific theory behind capturing meaty goodness in liquid form and why the pressure cooker makes great broth. 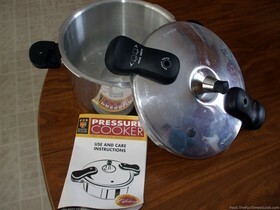 Gourmet Magazine provides great pressure cooker tips in the following video. They’re trying to prove that food from a pressure cooker can be tasty too. Learn how to use a pressure cooker to save time, save energy and make delicious healthy recipes. Plus, the differences between today’s modern pressure cookers, compared to yesterday’s models. Finally, this last video shows how to use a pressure cooker. It also provides a lot of great tips on why pressure cooking is better. One important cooking tip regarding pressure cookers is this: be sure you have enough liquid in the pot to get the job completed! My first attempt at cooking a batch of pork ribs resulted in the bottom surface of the meat becoming slightly overdone and crisp, because the pot ran out of liquid just as the meat was about done. 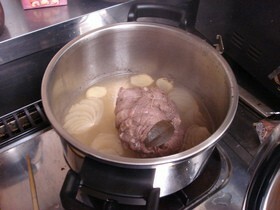 Looking at it as a rapid braise that requires a good amount of liquid for sauce would have been a better approach. Like any new (to me) technology, there’s a bit of a learning curve. And a final word of warning: a pressure cooker isn’t a pressure fryer! Never put more then a quarter-inch of oil inside a pressure cooker. You can’t safely duplicate Kentucky Fried Chicken at home, it takes specialized equipment for that.